TIFF Recompressor is a Windows tool that allows you to recompress your TIFF files. Normally, the Windows Scan & Fax utility will scan your documents and use LZW to compress them. Sometimes, you can get a better compression by changing the compression method or just storing them uncompressed and use another tool (Like PAQCompress) to further compress a TIFF file for archival purposes. 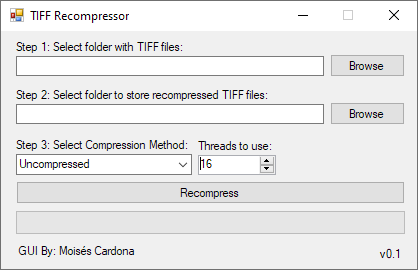 TIFF Recompressor will simply store a new copy of a TIFF file with the selected compression method or store a TIFF file uncompressed if the Uncompressed method was used. Drag and Drop a folder with TIFF files, or use the Browse button to select a folder. Use the second Browse button to browse for a place to store the recompressed TIFF files. Select a compression method and specify the number of threads to use. The Threads setting allows the software to process several TIFF files at the same time.